The room is buzzing this morning (not of the odorous variety) as my lovely partner prepares to take the girls on holiday. I don’t think I’ve seen them awake this early, being night birds who prefer to stay up late. I’m downing my usually morning caffeine intake whilst my sore throat and cold batters away at my immune system. Three days to fight back before I join my family in Center Parcs. 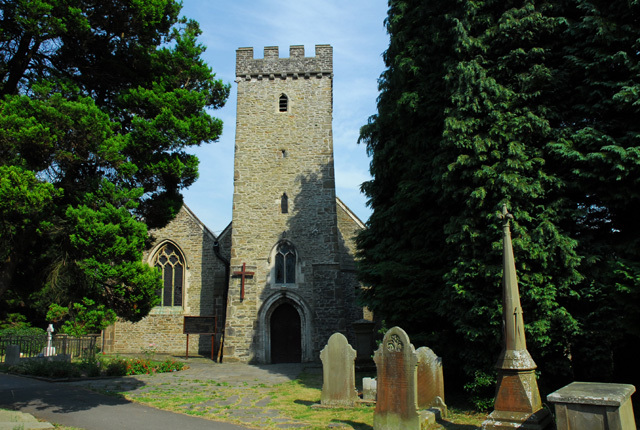 The temple/church scene that I wrote was based around Cadoxton church, my childhood religious establishment. I’d go to Sunday school there and learn about the bible, before being promoted to the church itself when my age range took me out of the classes. I even spent some time teaching there. Cadoxton church was where I got married and where the church service for my wife’s funeral was held so it means a lot to me and I know it well. It was easy for me to picture the small trail that runs up to the huge building, and the ancient, worn slabs that line the ground just outside the church doors. Its rather a grand building, and I didn’t want this image to be laid out on the canvas, but the huge doors were still used as it gave Khazar a significant presence to the reader. I think many horror movies have painted the church scenes as eerie and spooky, so although I didn’t go for this angle it will definitely play on the readers’ minds, particularly when dead start to raise out of the ground! Exploring Khazar’s thoughts, we see a definite change from the man who wanted power to one who thinks he is trying to save a decaying kingdom by wiping the slate clean. This is one of the things I love about his character; its up to the reader to decide what is the real reason behind his insane plan of mass slaughter. Does he actually do this because he feels it will help other people in the long run? The way his thoughts describe it this is certainly the way things are playing out but just because he believes it does that actually make it the reason why he is doing it? Is this just justification for his actions? Only the reader can decide.